Arapahoe Lodge Condo is one of the nine lodges in River Run in Keystone Real Estate. 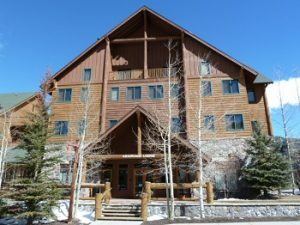 Located steps from the Keystone Ski Resort Gondola, Arapahoe Lodge Condo is as close to true ski in ski out condos for sale in Keystone CO as you can get. There are 40 residences comprised of 32 – 1 bedrooms, 7 – 2 bedrooms and 1 – 3 bedroom condo, ranging from 503 – 1922 square feet. The condos vary in views of the slopes, the center of River Run to down valley. Amenities are not sparse at Arapahoe Lodge with the use of the amenities located at Dakota Lodge which include a heated outdoor pool, hot tubs, fitness room, steam room and sauna. Arapahoe Lodge also has ski lockers and underground parking. Being located in River Run in Keystone, CO means you are close to several coffee shops, cafes, restaurants, bars, shops and of course the ski slopes. When looking at Keystone CO Real Estate take a look at all the River Run lodges have to offer including Arapahoe Lodge Condo.